The current recession is forcing college graduates to look harder for good jobs, but despite the economic downturn, qualified psychology students should have no problem finding jobs in various fields. Continued demand for qualified psychologists is attributed to the fact that psychology graduates leave school with numerous and flexible skills. 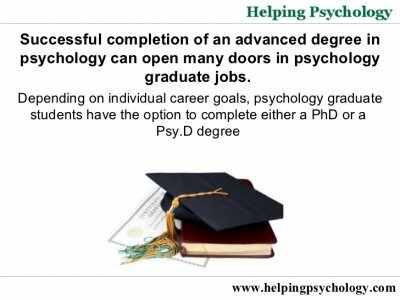 If between 73, 000-75, 000 expected graduates follow the same path as psychologists before them, as discovered in a survey administered by the APA's Research Office, the majority will begin working immediately, but some will simultaneously complete graduate studies part- time. Other graduates will attend graduate school at a later date. Although job prospects are still good for psychology graduates, the National Association of Colleges and Employers estimates there will be fewer jobs available for graduates this year. This organization estimates a 20 percent reduction in new hiring. However, as during previous years, most graduates, regardless of major, can locate entry-level opportunities in healthcare, government, business, social services, and education. Beginning salaries in these fields range between $18, 000-45, 000 annually, but salaries vary by geographic location and specialty. Graduates finding jobs in business typically earn much higher wages than graduates working for non-profit organizations and social services agencies. However, in all industries, wages increase as workers get promoted to administrative positions or acquire additional education. Employers seek graduates with skills and knowledge matching position requirements. Graduates can also find jobs by networking with professionals in fields they're seeking employment in. By networking and developing skills employers seek, graduates will have less difficulty finding jobs in a tough market. According to experts, employers want to fill open positions with graduates possessing outstanding qualities and a lot of potential. In most cases, they're not seeking applicants with a lot of knowledge; rather, they want to hire graduates with exceptional written and verbal communication, teamwork, critical thinking, and interpersonal skills. Students earning degrees in psychology will learn the skills employers are seeking, providing them with an advantage over graduates from other majors. These skills, often referred to as "soft skills, " in conjunction with quantitative skills developed by conducting research, prepare graduates to work as teachers, accountants, and real estate agents.